In a bygone era, professional punters could take a couple of hours to go through an entire day’s racing simply to find a handful of potential selections. They doubtless had frustrating mornings where they found nothing worth betting on after two or more hours of hard studying! Fortunately, things are a little different in the Internet era which is just as well because there are usually at least 20 races a day to choose from in the UK alone! On 13 April 2018 for instance, there were a total of 21 races in the UK with an incredible 36 the following day including seven races at the Aintree festival featuring the Grand National. You kind of feel sorry for organizers at Newcastle, Lingfield, Chepstow, and Wolverhampton because not many punters will care about these events! On the flipside, it could be an opportunity to find hidden gems (and we’ll do an article on that one later). As you know, there are National Hunt, Flat, and All-Weather races to choose from. I would suggest that you narrow your focus to one of these codes and stick with it. You can of course focus on one for a few months then switch to another during the season. For example, you could choose National Hunt from January to April, Flat from May to August, and AW from September to December. By doing this, you immediately reduce the number of races to focus on each day and save yourself a lot of time. On 13 April, it is National Hunt time which means Sedgefield and Aintree only. We’re already down to 14 races and we haven’t even looked at a race card! As much as I love festivals, I personally believe there is greater value in lower grade races when you know what to look for. As such, we can eliminate Aintree’s high-class events and focus on Sedgefield where all races are Class 4 or Class 5. The OR of a horse is the official rating it receives from the British Horseracing Authority (BHA). In a handicap race, the higher a horse’s OR, the more weight it has to carry in relation to the rest of the field. The goal is to make the race as competitive as possible. One OR point equates to one length so if a horse has an OR of 98 and is carrying 9-3, a horse with an OR of 95 will carry 9-0, which is three pounds less; not counting any jockey allowances which changes the picture. So, the first step is to look at the OR of each runner in a race when it finished in the top three. For the record, there are many ways to calculate a horse’s overall OR. You could look at races where it won only or events where it finished within a couple of lengths of the winner. Whatever method you choose, only focus on races with some relation to the race today. For example, don’t take into account a 5f race on firm ground if the horse is running over 1m 4f on soft ground today. As it is a UK race, I am only taking into account results on UK courses. Fighting Back: No relevant top-three finishes. Roman Numeral: Six relevant top three finishes with an average OR of 85.33. Igors Involvement: No relevant top-three finishes. Strait Run: Five relevant top three finishes with an average OR of 79.8. Budarri: No relevant top-three finishes. Booborowie: No relevant top-three finishes. PC Dixon: Five relevant top three finishes with an average OR of 85.8. Princess Mononoke: Four relevant top three finishes with an average OR of 98.75. Hardrock Davis: No relevant top-three finishes. You might be wondering what I mean by ‘relevant’. Today’s race is over 2m 178y so it makes little sense to include runs of 3+ miles or ones of less than 1m 4f. We can eliminate all but Princess Mononoke, PC Dixon, and Roman Numeral. Hardrock Davis is one of the favourites but has shown nothing to suggest he can win; but it is his first race with an OR and the Racing Post asserts he is on a low mark. However, we will exclude him from our calculations. Roman Numeral is a heavily raced horse and while he is reasonably consistent in races over this distance, only one of his places came over Heavy ground with an OR of 84. Princess Mononoke is an interesting proposition with several good recent runs including an excellent second place run over 2m on heavy ground in the last race. PC Dixon appears to be short in OR terms but is a major improver. All five places have come in the last six races with three of them on heavy ground. Moreover, his OR in the last race was 94 and he finished second, just three lengths behind Our Lucas. Our research suggests that it should be a straight fight between Pc Dixon and Princess Mononoke with the latter receiving preference for running in slightly more competitive races lately. Hardrock Davis is an unknown quantity because it is his first race with a rating. All you need is the Racing Post website and a calculator to eliminate non-contenders from every race. The fewer the runners, the quicker it will be. 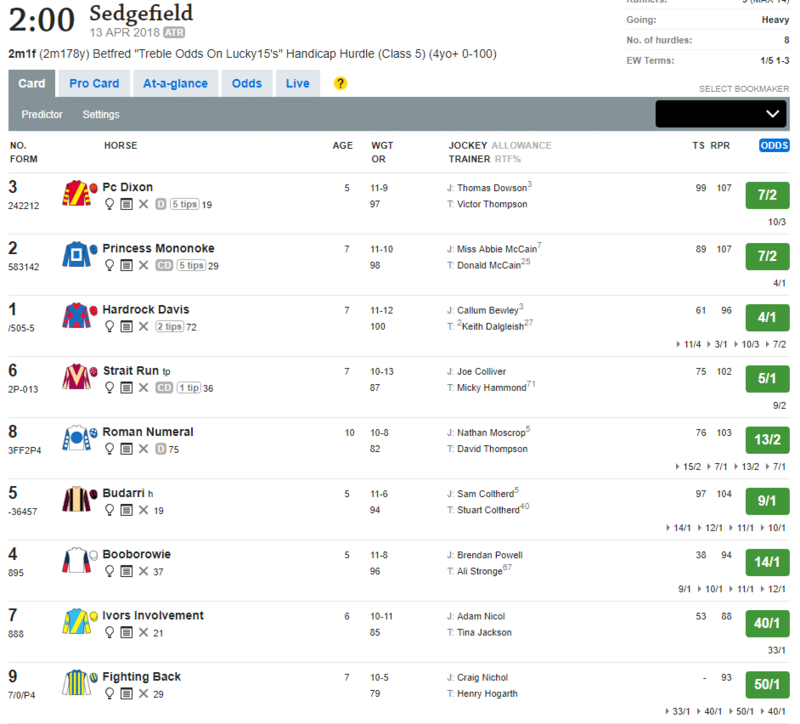 For example, the five-runner Sedgefield race that follows the one I highlighted can be analysed very quickly indeed. The outsider Bobonyx has numerous places but never with an OR of over 79. Major Ridge only have two relevant places with an OR of 85 and no recent form to speak of. Nelly La Rue’s relevant OR average is just 72.2 which means the horse is likely to be outclassed. In this particular race, the odds make sense as there are only two realistic contenders. Heresmynumber has five relevant places in his last seven races with an average OR of 94.4. Even if you don’t think he will win, he offers far better value than Nelly La Rue. Red Danaher is the favourite and has been running in far better company than the rest of the horses. His average relevant OR is 101 with a couple of good recent runs. 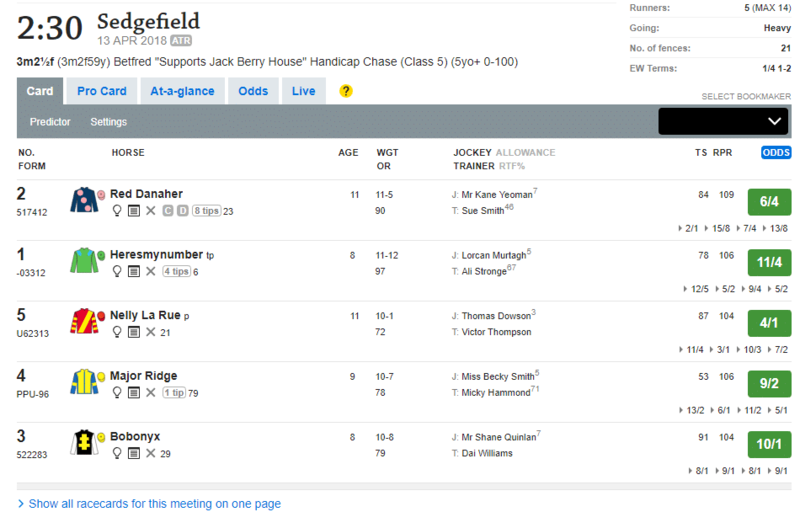 While Heresmynumber is an improver, Red Danaher is the class of the race and should win at 6/4. While this is clearly far from being a perfect system, it is a great way to trim the fat and narrow your focus. Not only will you take far less time to make your selections, but the quality of your picks should also be significantly better. No longer will you be wasting time and money on horses that have no realistic chance of winning, you’ll be giving yourself a real chance most of the time. Use this method and let us know how you fare; good luck!